I'm really trying to hop aboard the pumpkin train, though it left the station without me many years ago. While I've given up on mushrooms and beets, I think there's still hope for this pretty and versatile winter squash. One way to raise the odds of me liking something is to put it in a dish of macaroni and cheese. I tried that here, not with pumpkin itself, but instead making use of Bruegger's Bagels Made-In-Vermont pumpkin cream cheese. The resulting side dish had a subtle and very agreeable level of pumpkin flavor, and it was supremely creamy. It practically screamed "FALL IS HERE", and I didn't mind that one bit! You can easily cut this in half, but why bother? The leftovers can be just as delicious (though the bread crumbs do lose much of their crispness). This is a fabulous dish to make and serve as the air turns cool and summer is convincingly replaced by fall. I have two $10 gift cards for Bruegger's to give to two lucky winners. Fill out the Rafflecopter below for your chance to win! I'll randomly select the winners in one week; be sure to leave an email address so I can reach you! Cook macaroni according to al dente using package directions. Meanwhile, melt 4 tablespoons butter in a large saucepan. Stir in flour until smooth and let it cook for a minute or two, stirring constantly. When the roux begins to darken, gradually add milk. Bring to a full boil; cook and stir for 2 minutes. Reduce heat and add cheeses, mustard, salt, pepper, and nutmeg. Stir until cheese is melted and sauce is smooth. Transfer to a greased shallow 3-quart baking dish. Melt remaining 2 tablespoons butter, then toss with bread crumbs. Sprinkle over macaroni and bake, uncovered, 15-20 minutes or until bubbly and golden brown. What a comforting and delicious treat! That pumpkin cream cheese sounds really interesting. 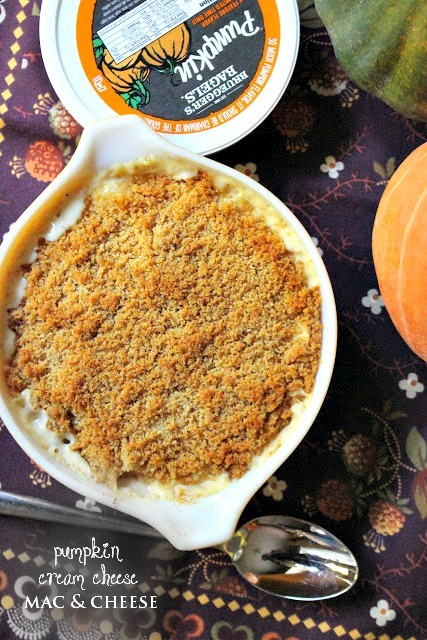 This ridiculously creamy macaroni and your cheesy pumpkin spice squash have convinced me I clearly need to rethink my "no cheese with pumpkin" stance :) Can't wait to try this recipe,thanks Grace! A great looking m&c dish, to be sure! I like strawberry cream cheese, but this pumpkin flavor sounds delicious! I just finally started liking fresh beets that are roasted... still can't do canned. I do love pumpkin though and this mac & cheese has me drooling. Just when I was craving mac and cheese! What a great idea. Pumpkin and cream cheese all in one sounds great in this. I usually use plain cream cheese (though I'd try pumpkin in a minute)--does that make me boring? I love Chive & Onion cream cheese. Grace this mac and cheese looks and sounds just delicious! I like just plain cream cheese most of the time, but I'd love to give this pumpkin cream cheese a try!! Oh I really love the honey walnut cream cheeses! So yummy! Wow, this mac and cheese looks delicious Grace...especially with the pumpkin cream cheese...I would love to dig my fork in it! I love the fruity flavors of cream cheese like strawberry. My favorite changes with the seasons... Pumpkin right now! This looks so creamy and amazing! What a genius way to use cream cheese. Yum! !